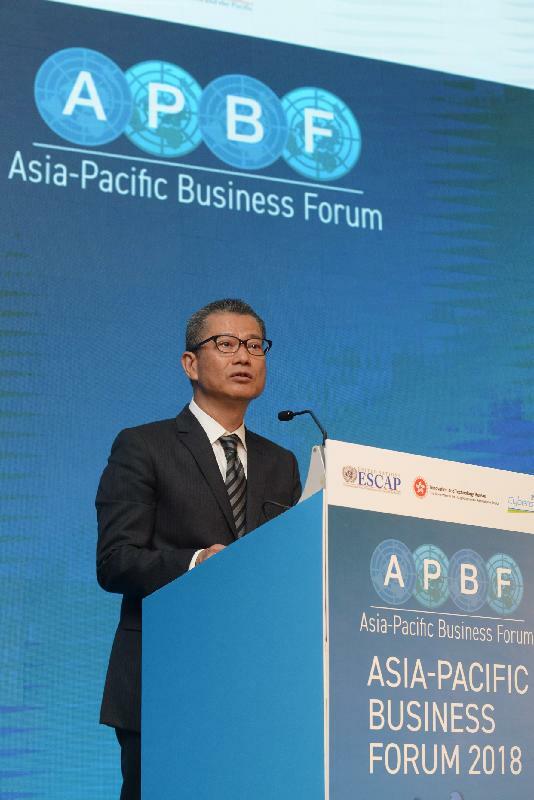 I'm pleased to join you today for the opening of the Asia-Pacific Business Forum, taking place in Hong Kong for the first time since the Forum was established in 2004. The theme of this flagship regional business forum is "Harnessing Business to Achieve Sustainable Development Goals through Technology, Innovation and Financing". When it comes to financing, you're certainly in the right city. One of the world's leading financial capitals and China's major international financial centre, Hong Kong is indisputably well positioned to meet the varying financing needs of tech companies, and of all companies in fact, whatever their business, their size and their stage of development. Our stock market capitalisation rings in at more than US$4 trillion. And in terms of funds raised through initial public offerings, the Hong Kong Stock Exchange has topped the world in five of the past nine years. Last year, we raised some US$16.5 billion. We have recently reviewed our listing regime to look for ways to facilitate the listing of emerging- and innovative-sector companies here in Hong Kong. We are proposing to permit the listing of pre-revenue biotech issuers as well as companies from emerging and innovative sectors with weighted voting right structures. We are also proposing to establish a new concessionary secondary listing route for Greater China and international companies that wish to secondary list in Hong Kong. A market consultation on these proposals has just been completed and I look forward to the implementation of the new listing regime very soon. As for innovation and technology, without doubt it is the most powerful driver of the global economy in this increasingly globalised, technology-transforming world. It is certainly central to Hong Kong's policy agenda and critical to the sustainable development of our city. 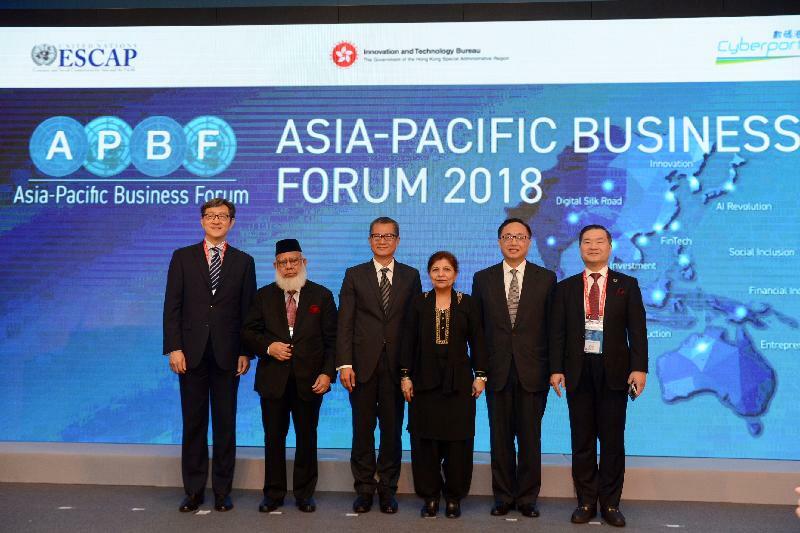 Substantial resources have been allocated in the past few years to support the development of innovation and technology, with a focus on four critical areas, some of which have been mentioned by Dr Akhtar just now, they are biotechnology, artificial intelligence and robotics, smart city and Fintech. This year, some additional HK$50 billion - that's nearly US$6.5 billion - has been earmarked for supporting the development of innovation and technology and smart city initiative. Part of the additional resources will be provided for Cyberport, Hong Kong's ICT flagship and today's venue host, to enhance support for start-ups and promote the development of digital technology ecosystem. One of our key initiatives that I would like to highlight is our plan to establish two research clusters - one for healthcare technology, the other for artificial intelligence and robotics technologies. The objective is to attract more renowned international and Mainland research institutions and technology companies to Hong Kong and to bring in more experts from around the world, thereby helping us nurture our home-grown talent. I am confident, let me add, because of our encouraging track record in this regard. For example, in late 2016, the celebrated Karolinska Institutet of Sweden opened its first overseas research facility for Reparative Medicine at Science Park. Then, last September, the Massachusetts Institute of Technology opened its first overseas Innovation Node here, providing entrepreneurial education and training for students and researchers from MIT and from Hong Kong as well. MIT has also established a consortium here for R&D collaboration, with the support from the Hong Kong University of Science and Technology. To date, our Innovation and Technology Fund has supported 13 of the MIT-led consortium's R&D projects, ranging from the Internet of Things for intelligent buildings and transport to e-learning research. And we will also launch a Technology Talent Scheme later this year. New initiatives include the creation of a Postdoctoral Hub scheme, designed to help recruit post-doctoral talent for our research institutions. The scheme will also fund local companies on a matching basis to train their employees in high-end technology. Of course, it helps that Hong Kong boasts world-class ICT infrastructure, counting 11 regional and trans-Pacific submarine cable systems, 20 overland cables systems connected to the Mainland of China and 10 external communication satellites. Our average internet connection speed is the world's fourth-highest. Our household broadband penetration rate exceeds 92 per cent, and our mobile penetration rate, at 247 per cent, is among the highest anywhere in the world. According to Compass, a San Francisco-based research firm, Hong Kong is among the world's five fastest-growing start-up centres and one of the world's top 25 start-up hubs. The start-up scene here, I should add, is flourishing. InvestHK's latest Startup Profiling Survey shows that start-ups this past year has gone up by 16 per cent, to 2 300, with a 21 per cent gain in start-up jobs, to some 6 300. Ladies and gentlemen, we believe innovation and technology is not just a single industry but a new model of development - one that sets new industries in motion, gives fresh impetus to traditional industries, creates wealth as well as a flourishing future for our young people. Today's Forum is a timely and welcoming platform for sharing our experience in embracing innovation and technology, and in turning inspirations into applications, and exploring how I&T can bring real and long-term benefits to our society and mankind. I wish you all a rewarding Forum and a future blessed with thriving, sustainable businesses. For our guests coming from abroad, a pleasant and an enjoyable stay in Hong Kong!